It was all about the foot bath. Do you know how to get a homeless person to trust you, if you're a physician working at a shelter? Don't ask them how they are feeling or what's bothering them, and really don't ask to examine them. Maybe--no, certainly--don't tell them you're a doctor. Instead, offer them a hot, medicinal foot bath. And maybe a pair of dry socks afterward. After a few weeks, again maybe, they'll tell you what's bothering them. I learned that from James O'Connell, MD, when I was directing media relations for the Robert Wood Johnson Foundation and he was directing our national program for homeless families. 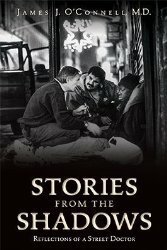 And as O'Connell is quick to say in his new book, Stories From the Shadows: Reflections of a Street Doctor , he learned it from a seasoned team of nurses when he first started treating homeless people. In fact, the nurses ordered the neophyte doctor to avoid telling anyone he was a doctor, and set him to the task of giving those foot baths every day for two months. Set up your story: O'Connell likes to use the foot baths, his own introduction to these patients, as an entree for his listeners. But he often begins presentations by showing a picture he'd taken from the roof of Boston's biggest homeless shelter, showing the long, snaking line of homeless people queued up to enter at the appointed opening time--a daily line. Then he talks about the foot baths, and how long many of his patients had walked that day before getting to that line, mileage that puts your exercise regimen to shame. It's an irresistible set-up for his stories, one that puts the listener in the moment. After that, you and your attention are in the palm of his hand. It's not about you, the storyteller: I don't think I've met a more humble person in my career, and the evidence is in O'Connell's stories: He is continually giving credit where it's due, to the nurses or the homeless patients who have taught him these insights. In that way, he becomes simply the storyteller, getting out of the way of his own story and letting it take the spotlight. It's refreshing, and effective, every time. It stays messy: O'Connell is not a saint (and that was one of the questions in his Fresh Air interview). In fact, he shares stories that are as messy about him as they are about his patients. Far from being inspiring because they always turn out wonderful, these stories have not been neatened up into "happily ever after" scenarios. Plenty of time is spent on struggles, failures, and less-than-ideal endings. As a result, we trust these stories more. The eye for detail should never shut: When O'Connell starts describing his work, you can see it in your mind's eye--a tactic I call the invisible visual. He doesn't really need slides to describe what he does, so well does he share the details that make the story concrete, and credible. These stories don't need embellishment, just the details. O'Connell's book benefits Boston's Health Care for the Homeless program. Buy it, and learn from it. Give it to your CEO, and to your speechwriter. It's a true treat for me to hear him telling these stories for a wider audience, and in this holiday season, the stories will remind you of what you're grateful for. Check out the other posts on storytelling ideas and tactics in our Tell It Better series. I've got a workshop on Creating a TED-quality Talk coming up in January 2016 in Washington, DC. It repeats twice in that month: on January 14, and again on January 28, and I'm limiting them to 5 seats per session. All registration closes at the end of December or when all seats are filled, whichever comes first. Please join us, whether your goal is TED, TEDx, or just an elevated, current presentation style.